It’s hard to believe that it’s that time of year again… it seems like just yesterday we were celebrating the end of school, and now suddenly we’re prepping to head back! At a time when we should be celebrating the end of summer, we often find ourselves racing around like mad to get everything ready for the kids’ big day. What do you do to prepare? 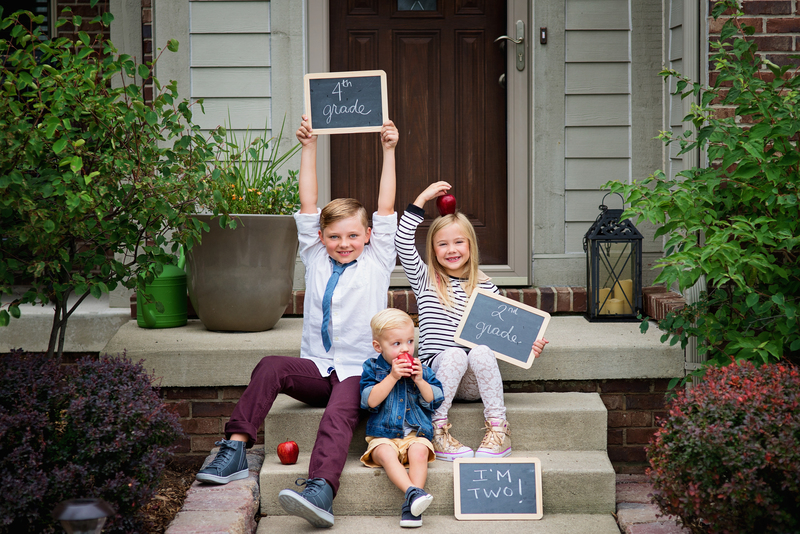 We asked MEGLEEWEST fashion blogger and mom of three Meghan Westbrook how she plans her attack, and she had a lot of great ideas on how to stay organized and relieve potential first day jitters. As soon as the supply lists come in the mail, I hit the store immediately. A lot of things sell out quickly and I want to make sure I get all the items on their lists with plenty of time to spare. I try to purchase extra where it seems reasonable. Often teachers will ask for additional supplies throughout the year as they run out, so I’m one step ahead of the game when these lists get sent home and my items are ready to go. It’s also good to have extra pencils, glue, and markers at home for school projects. I can’t tell you how many times I learned this the hard way doing last-minute projects in years past that I didn’t have glue for, or tape for that matter! As far as clothing, I keep things to a minimal to start. Let’s be honest – underwear and sock restocks are first on the list! A fresh couple pairs of PJs as we slide into the chillier evenings of fall somehow makes everyone “sleep” better (strange but true!). We go through everyone’s closet and drawers and pull out anything that doesn’t fit so 1. we are decluttered and 2. we know what we have to start. I like to take those items to a consignment store and get a little cash back in my pocket to help with the new items we’re about to shop for (cha-ching!). Generally, I look for a couple pair of jeans, pants (leggings for my daughter and something easy to pull on for my son, such as joggers), a couple new tees that aren’t too summery (great to layer under long sleeved items), a couple tops with longer sleeves, a hoodie, as well as a fall coat and new backpack, if needed. The most important item on my list though is SHOES! Everyone needs new shoes – especially kids with their fast-growing feet!! My kids require a great pair of gym shoes and then I like something a little more casual in addition to those, to give them variety. Gym shoes in my opinion are the number one playground necessity! I want them to be comfortable as they are running around (like when my daughter chases the boys) and provide support while they are in gym class. My son will be looking snazzy and cool in his Burst – In the Mix Skechers. My daughter will be equally fun and fresh in her Burst – Ellipse pair. These are great choices as they both provide Air-Cooling technology and Memory Foam. This section is quite simple… your kids need haircuts! I’m telling you. Even if you cut their hair a few weeks ago, plan the back to school cuts 1-2 weeks before school starts. Most often Picture Day happens in the first couple weeks, so what you think “looks good” now, will probably NOT look good in a couple more weeks, trust me. I have mom-failed at this many times! Make your appointments a month before school starts and set them for 1-2 weeks prior to the big day. The earlier you call, the more appointment times you’ll have to choose from. Don’t be left trying to fight the crowd or worse, wait until after school starts and fight your schedule and the kids’ new schedule! My daughter and I hit the mall for her cut. She has a hot pink streak in her hair that we get touched up every six months. My boys, on the other hand, can head out with dad. What a fun date day! The girls can hit the mall and shop (win-win) while the boys can hit the barber and… well, do whatever it is that dudes do! My guy will be heading out in style. My hubby is sporting his Relaxed Fit – Palen – Nieto kicks with gel-infused memory foam. My oldest is feeling as cool as daddy in his memory foam Outgo kicks! Why is lunch planning important? Because I guarantee you your child does not eat the same thing today that he/she did last week. OK, welcome to lunch planning. I sit down with each child a week or so before school and talk about lunch items they had last year, things I have noticed them eating or not eating this summer, and go over expectations – both mine and theirs. We brainstorm new lunch menus. I want to make sure I am not heading to the grocery store buying items they won’t eat, but in fact getting items they have requested within reason. If your kids buy hot lunch at school, you can turn this into dinner planning with the same concept. Additionally I like to go over their schedules as far as afterschool activities. This way, everyone knows where they are going each evening if they do have an activity. This also helps with dinner planning. Lastly, I check the old containers and this is usually a good time to replenish the stock of sealed containers, purchase new water bottles and thermoses, as well new ice packs. One last key item to bring this all together… a new lunchbox! Skechers even has their very own here. Mornings are busy. Keep things simple by finding something easy to throw on without taking the extra time to lace up while running out the door. I’ll be sending my littlest off in his Lil Lad – Swagy soles. My oldest will be confident in his Skechers Throwbax. My daughter will be the talk of the bus stop in her Nebula – Prism Pop Skechers, and she wouldn’t have it any other way! I’ll be keeping things easy and comfy in my air cooled, Flex Appeal 2.0 memory foam sneaks. I like to get the kids back into a routine before the big day (or try to, anyway). We hit Move-In Night at our school so they can meet their new teachers, find their lockers, and see their friends they’ve been missing all summer. We review where other classrooms are and talk about the bus route if we have any changes for the new school year. Taking a trip to the bus stop and reminding them to “BEHAVE – this is someone else’s driveway you’re standing in every morning” is always a plus! Then there is that First Day outfit. We choose our outfit a couple days before and get everything laid out and ready to go to make sure that first morning is a breeze, or close to it! Do you take photos the first day? We do. I’ll admit they are usually lame with us all standing at the bus stop holding fingers in the air to show what grade everyone is in. This year, I decided to get all Pinteresty and make signs. OK, I bought signs, and I bought chalk. Cute, simple, and reusable! My little Princess will hopping her way to her classroom in her lighted Twinkle Toes – Shuffles – Sweetheart Sole. My 4th grader’s stylin’ in those kicks he wore with dad earlier, Outgo. And our little man’s just turning two, but he needs shoes to run around in as well – his Lil Lad – Swagy will allow him to do just that. This should be a no-brainer… ENJOY THE LAST DAYS OF SUMMER! You know it flew by. Take time in these weeks before school starts to enjoy your time as a family. Get the ice cream you’ve been promising all summer. Hit up the local Farmer’s Market. Go see that movie they’ve been waiting to see. Take one last road trip if you can. Hit up the park and have a picnic. Spend the time with your children before school starts. Continue to make the memories and build on the bonds you have created. 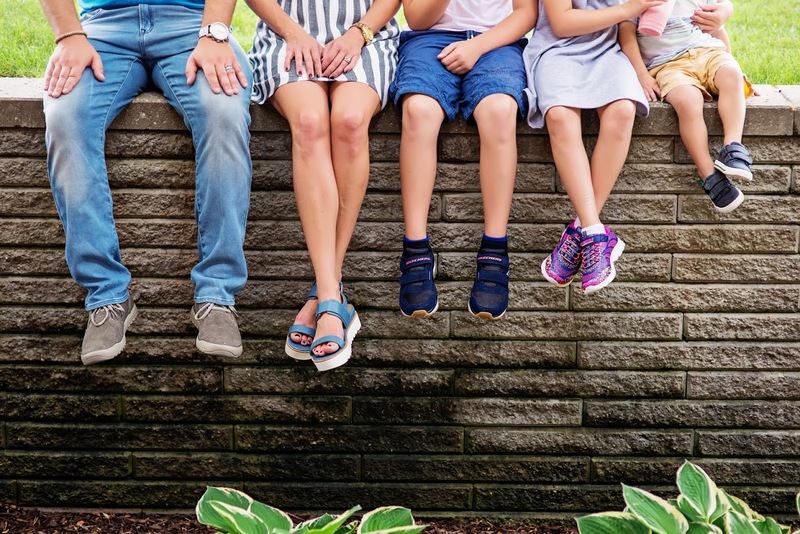 My husband is doing it all in his Oldis – Stound Skechers (at select Skechers retail stores) – they go with everything and make chasing little ones around a breeze. I like to be stylish, but I also like comfort and mobility. The Jitter Bug sandals (at select Skechers retail stores) give me the best of both worlds! Meghan Westbrook is the blogger of the fashion, beauty and style site, MEGLEEWEST. Check out her tips and pics of the newest trends, home decor and more at Facebook, Instagram, Pinterest and Twitter. What a cute family! I’m loving the road trip suggestion! I love that these shoes are still athletic but so stylish! I need those mama sandles too! 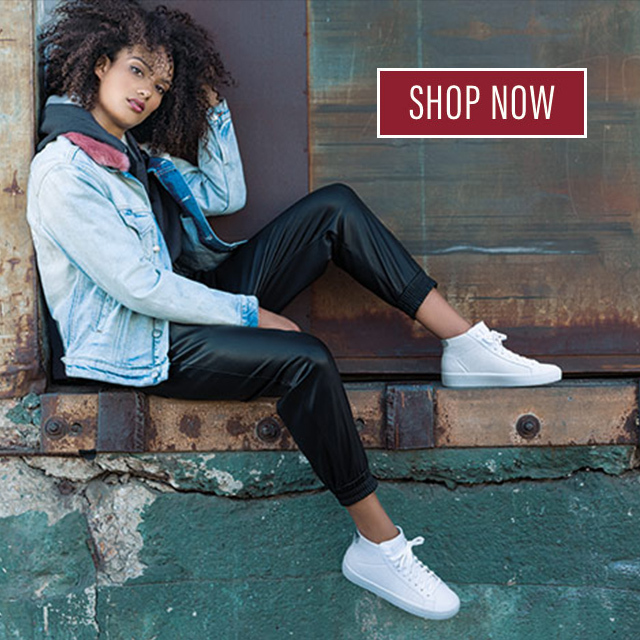 Pingback: Back to School w/ Skechers!